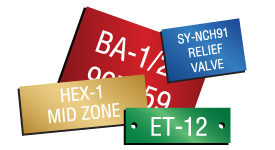 Design and buy your own custom nameplates easily with our nameplate design tool. Available in 1/16" Plastic, 1/16" thick non-conductive Phenolic Plastic, or 1/32" thick Anodized Aluminum. 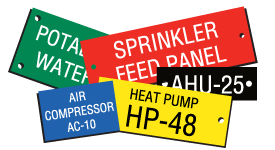 Our nameplates are low glare, scratch resistant. By default, these nameplates are engraved (plastic) or laser etched (aluminum) on one side. Beveled edges for a neat finished look on plastic nameplates. 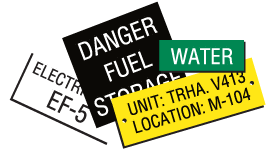 Mounting options are: LEED Compliant adhesive backing, mounting holes or both. Other options, such as 1/8" thick plastic, 2-sided engraving, and additional colors also available. Please call for pricing.